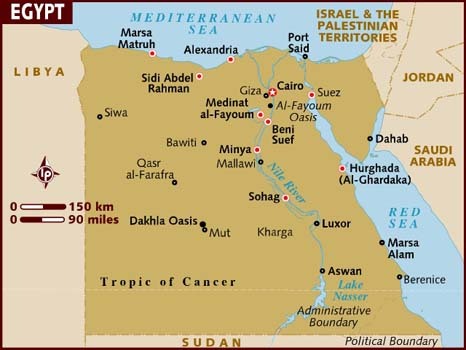 Together with the rest of the world we have been watching the current unrest unfolding in Egypt with a mixture of anticipation and unease. We have not commented until now because this has been primarily a political issue. However, as the situation unfolds, we feel we can no longer keep silent as developments threaten to shake the precarious existence of religious minorities like Christians and Bahá’í’s, as well as Egypt’s peace treaty with Israel and peace in the Middle East more generally. We believe that President Hosni Mubarak should leave, but we are concerned that under current circumstances his abrupt departure will create a political vacuum which will be filled by Islamic extremists. The West appears to be embracing Mohamed El Baradei, a former head of the UN nuclear inspection agency, as a replacement for Mubarak. This is of serious concern as El Baradei, in addition to betraying heavy anti-Israel sentiment through his actions at the UN agency, is reportedly communicating with the Muslim Brotherhood, a banned Islamic extremist movement, in order to actively involve the Brotherhood in the future political landscape of Egypt. El Baradei intends to include the Muslim Brotherhood, “an integral part of Egyptian society”, in the political process and has called the Brotherhood “a conservative group that favors secular democracy and human rights” [emphasis added]. Western news outlets have adopted the claim that the Muslim Brotherhood is a conservative, non-violent movement. Nothing could be further from the truth. While it officially renounces violence, the Muslim Brotherhood is the ideological parent of terrorist movements such as Hamas and Al-Qaida. Members and supporters of the Muslim Brotherhood are behind daily forced conversion attempts, violent attacks, and torture against Egyptian Christians. The Brotherhood cooperates with Hamas in Gaza and leaders are determined to launch war against Israel. This is a very serious matter and we cannot, under any circumstances, allow the Muslim Brotherhood to increase its influence in Egypt. To do so would be to condemn the Egyptian people, from Christians and other religious minorities to moderate and secular Muslims, to a regime of oppression and religious tyranny that will make Mubarak’s repressive regime seem like a beacon of freedom. OFWI stands unequivocally with the people of Egypt in their aspirations for freedom, democracy, and human rights. As we watch events unfold over the next days, weeks, and months, however, we must bear in mind that democracy as we know it in the West cannot simply be transplanted into Egypt, a country that has never experienced any form of true democracy and whose population is about 30% illiterate. Democracy cannot survive where people cannot read their own constitution. It must be taught, nurtured, and brought to maturity so that it can flourish. If we do not do this we risk repeating the Iranian scenario where pro-democracy forces deposed the shah in 1979 but were quickly overcome by the radical Islamic ayatollahs. Egypt desperately needs change. Mubarak is 82 years old and has held on to power through emergency measures and manipulated elections for 30 years. We must help Egypt move forward into an era of freedom, human rights, and democracy. However, before we make democracy our new idol, we must never forget that democracy brought Hamas to Gaza and Hitler to Germany. Let’s make sure that we do not repeat these tragedies in Egypt. • for the western and world leaders, that they would have the wisdom to respond appropriately and to help guide Egypt peacefully into a new era that would bring freedom, peace, democracy, and prosperity to its people. • they must ensure that they do not support any process or outcome that threatens the peace between Egypt and Israel or peace more generally in the Middle East.